Everyone knows the cliché of the starving artist. Parents discourage their kids from becoming artists in fear that their kids will end up struggling to support themselves. In today’s society, entrepreneurs are celebrated for creating successful businesses. But did you know that artists and entrepreneurs have a lot in common? Both like to march to the beat of their own drum, both are risk takers and both are creators. Both have vision and a need to create. So if artists and and entrepreneurs have a lot in common, then why is it that so many artists fail at business? What makes somebody a Vincent Van Gogh, an artistic genius who ended up dying broke, versus Thomas Kinkade, an artist who became one of the most wealthy ones of all time? The main reason why artists fail at business is because they don’t identify a viable market to fill. Creating art is a self indulgent activity. Artists listen to the inner voice that drives them to create. Overall, it’s a really great thing. Art has the power to move us, to transport us to new worlds and to inspire us. And creating good art is difficult. It takes a lot of introspection and searching. But creating good art isn’t enough to make a viable business. A lot of artists who go into business for themselves try to start a t-shirt or print business. They usually fail because there aren’t enough fans of their work to sustain the business. The barrier to entry is pretty low, so there’s also a ton of competition. Furthermore, the market size for art prints is pretty limited. Most people who buy art prints are art students or fellow artists. People usually buy a t shirt because they relate to it in some kind of way, not necessarily for the art. So when it comes to making a business, artists need to think not only about what they want to make but also why a consumer would want to buy it. What’s the need and and how can they fill it in a unique way? Aligning your artistic passion and with a market need is the challenge for the artist entrepreneur. It’s all in the mindset. The designer’s approach is completely different than the artist’s. A designer constantly thinks about the end user. They conduct market research, identify a problem, and then use their artistic skills to create something that fills a market need. This is why creative problem solving is one of the most important skills of a good designer. Artists will become more successful at entrepreneurship by thinking more like designers. They have to think about how they can take their art and leverage it in solving a problem. What is a product or service people need, and how can they fulfill it? How can they delight people with their art and solve their problem? Recently I started my own business, Live in a Story, with a few friends. We started a wall decal business. I noticed a lot of wall decal companies fulfilling a need. Parents need to decorate their children’s rooms in a cost and time efficient way. Wall decals make a lot of sense. They are easy to apply, removable, inexpensive, and safe. This is one of the rare opportunities where I saw a clear market need and thought that I could offer a better product than the existing companies out there. The art that wall decal companies currently offer is pretty bad. They look generic and the quality of the decals is often cheap. When I thought of the idea of making wall decals with friends from the publishing industry, I got really excited. 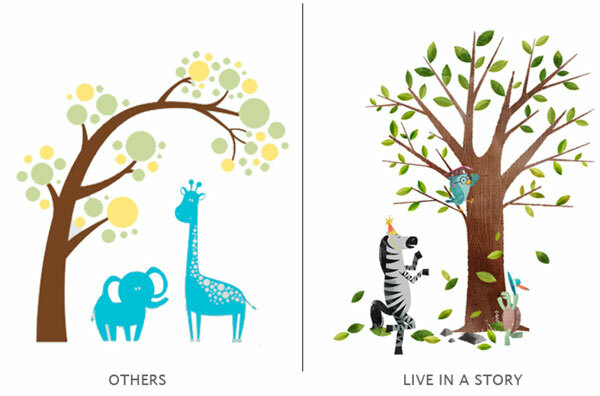 Wouldn’t it be great to make wall decals out of the best children’s book illustrations? We would be fulfilling an existing need and offering a better product. We could offer more value by providing gorgeous art from artists who have dedicated their lives to making art for children. Entrepreneurs are system builders. Their art is creating their own business and design is only one part of the system. There’s so much more to consider. Marketing, sales, and customer service are just a few. The reason why Vincent Van Gogh died alone and broke wasn’t because his art wasn’t good. It was because he wasn’t an entrepreneur. There wasn’t a current market demand for his paintings and he didn’t know how to market or educate the public to create demand. As for Thomas Kinkade, despite the fact that art critics loathed his art, he was able to successfully market and sell his work to mainstream America. He was a very good entrepreneur and a savvy marketer. He coined himself the “Painter of Light.” Kinkade also built a scalable business model and a system for production. He had a factory producing prints and workers that dabbled paint onto prints to make them seem like unique paintings. As an artist and an entrepreneur, I think a lot about what I want to create in the world and how to make a living doing it. I have a bunch of entrepreneurial heroes: Walt Disney, Jim Henson, and Steve Jobs just to mention a few. What all these entrepreneurs have in common is that their business is their art. They had a deep passion for building their business and a strong sense of purpose. For Walt Disney, he wanted to make cartoons, then thought of as just short films, into full length feature films. Jim Henson wanted to show that puppetry could be a real art form for stories. And of course Steve Jobs wanted to make technology accessible to the everyday person through good design. The mission of Live in a Story is simple. Connect the work of artists to families through dazzling consumer products. We’re working hard everyday on this mission. To be successful at entrepreneurship, artists need to think more like designers in creating product and they have to embrace the role of a system builder. Two resources I found useful before starting Live in a Story was Michael E Gerber’s book, The E-Myth,and Steve’s very own Profitable Business Online Course. The EMyth goes into depth on the importance of building systems in the mindset of building a franchise. 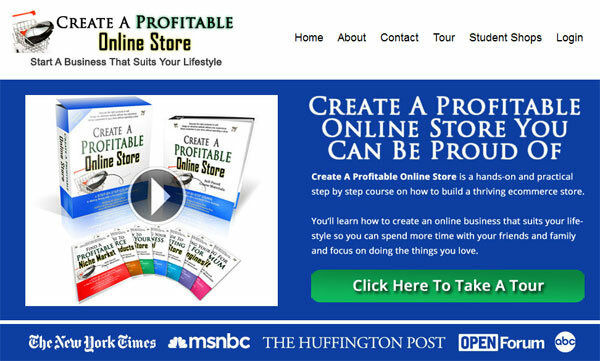 Steve’s course is great because he gives you personal knowledge on the components that make up a profitable online store. Steve’s class gave me the confidence to start Live in a Story, and I’m so excited about bringing the best talent in publishing into the homes of children as products. If you have the urge to create a business, listen to that inner artist inside. What motivates you? What’s your art? Then put on your designer hat and think about a product or service you can provide that solves a problem. When you start your business, you’ll become a system builder and wear multiple hats. That’s when your are an entrepreneur! Don’t be afraid to start. There are a lot of good resources and people to learn from. Wow, I can really relate to this article. It’s so easy to understand myself to takes a whole lot more work to understand others. This is a great illustration between what makes a great artist and entrepreneur. I know so many talented people who struggle financially because they can’t figure out how to take that step. I love that several prominent artists (such as Steve Jobs and Walt Disney) were mentioned to help prove that it is possible to be an artist and entrepreneur. Fantastic article and I look forward to reading more! I’m sharing this. There is also the peer pressure from other artists or even oneself to not become a “sell out” and staying true to your beliefs. Kinkade is perhaps not the best example of staying true to your beliefs and not just making whatever sells. I’m a designer and my wife is an artist, and design and art really are two different professions although they can overlap. Really interesting read. It’s so true that being a great artist isn’t the only key to success. Luckily the internet can help get your art to those who will appreciate it. Plus there are free services like Jigoshop so it doesn’t cost the earth to set up a professional looking online store. I love the comparison, both the similarities and the contrast. My friend runs a website called Launching Creative and his goal is to basically get artists to become entrepreneur-minded. This article basically sums up what he does. His motto is “the anti-starving artists”. This was a great read, btw. Wow! You have written a very nice and detailed post on a niche that most people don’t even think to write on. Thumbs Up!! Just heard your interview on Smart Passive Income. I then clicked here… and oh my. I’m going to need to read this post a couple of times. You really provided a lot of applicable advice. One thing I’ve found with artists is they’re afraid and I don’t blame them. They think “what if no one likes my work?” I get that they feel vulnerable. I feel that way every time I write a blog post or upload a podcast. I tell them there are many people who want original artwork to add to their home decor. I know I am! I’m going to link this article and quote on my website. Let me know if you’re not cool with that. Very smart of Kinkade to market himself as the “Painter of Light.” Also, you mentioned Steve Jobs, and I believe he was wildly successful because he had a fine-tuned idea of exactly what his audience wanted, and then used that to make billions for Apple–which is your point in this article of listening to the demand. Anyway, this is an excellent piece overall!